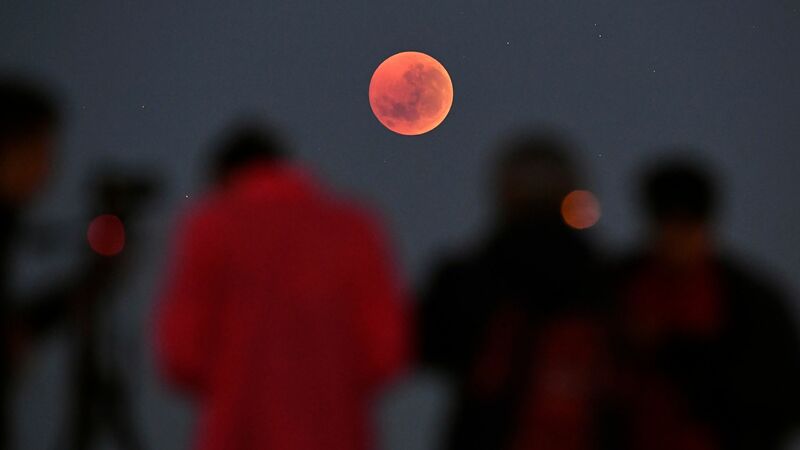 Coming Sunday night: "Super blood wolf moon"
Starting tomorrow night, North and South America will see a total lunar eclipse and supermoon wrapped into one, AP's Marcia Dunn writes. "The moon, Earth and sun will line up ... for the only total lunar eclipse this year and next. At the same time, the moon will be ever so closer to Earth and appear slightly bigger and brighter than usual — a supermoon." The eclipse starts Sunday night or early Monday, depending on where you are, and will last about three hours. "It begins with the partial phase around 10:34 p.m. EST Sunday." "Totality — when Earth's shadow completely blankets the moon — will last 62 minutes, beginning at 11:41 p.m. EST Sunday." "If the skies are clear, the entire eclipse will be visible in North and South America, as well as Greenland, Iceland, Ireland, Great Britain, Norway, Sweden, Portugal and the French and Spanish coasts." "During totality, the moon will look red because of sunlight scattering off Earth's atmosphere." "That's why an eclipsed moon is sometimes known as a blood moon. In January, the full moon is also sometimes known as the wolf moon or great spirit moon." "So informally speaking, the upcoming lunar eclipse will be a super blood wolf — or great spirit — moon." Watch a livestream from the Griffith Observatory in Los Angeles, beginning just after 10:30 pm ET.